NCD Governor Powes Parkop is appealing to the University of PNG student leaders to deliver their petition to the Prime Minister themselves. “This is the means by which they agreed to pursue their demands. An opportunity was given to them last week and they turned it down. It was consistent too with their demand that the Prime Minister or ‘his representative’ receive their petition. Parkop pointed out that since independence, no prime minister has gone to UPNG or elsewhere to receive any petition, especially in the environment of boycotts or protests. 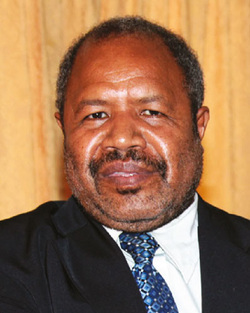 All PMs in the past have maintained a stand to protect the integrity of the Office of The Prime Minister of Papua New Guinea so that a precedent is not set where the incumbent PM has to succumb to threats and or demands. “At the same time, I condemn other members of society, or keyboard warriors, who took advantage of the situation to create fear and anxiety by distributing in social media and other means, a warning to businesses, schools and the public in the city of an impending civil unrest. Such actions are unacceptable,” the Governor said. Parkop stated that inciting fear, threatening violence or looting and destruction is completely irresponsible and it will not be tolerated. It also does not set a positive precedent to our children and our future generation. “We are doing all we can, especially in the city, to prepare for international events, to build a city that is safe and peaceful for all, so I call on the student body at UPNG to support good in the country and to disassociate themselves from these agitators as they are a liability and will bring a bad name to the student body. Governor Parkop also appealed to residents of the city to remain calm and go about their business as usual. “I appeal to the student body and the so-called civil society activist or agitators to respect the rights of people in the city to their normalcy, especially the schools and business houses,” the Governor said.